Photo credit, page 1: © University of Florida. 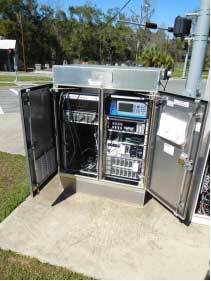 The University of Florida uses this signal controller to optimize signal phase and timings in real time as part of its research into cyber physical systems. As America’s urban population multiplies, so does the number of cars on city streets. The resulting congestion can contribute to increased or unreliable travel time. For its 2016 Urban Congestion Trends report, the Federal Highway Administration (FHWA) calculated the hours of congestion in 52 of the largest U.S. metropolitan areas at 4:43 hours, up from 4:22 hours 5 years earlier, as noted in the 2011 Urban Congestion Trends report. The emergence of highly automated vehicles could help improve urban mobility if the cars can be safely integrated into cyber physical systems (CPS) that also include technologically advanced traffic signals and road sensors. 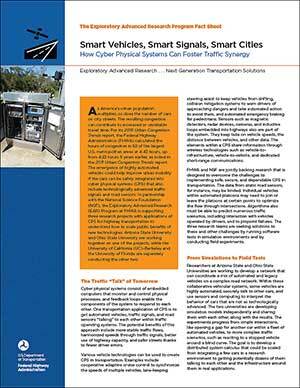 In partnership with the National Science Foundation (NSF), the Exploratory Advanced Research (EAR) Program at FHWA is supporting three research projects with applications of CPS for highway transportation to understand how to scale public benefits of new technologies. Arizona State University and Ohio State University are working together on one of the projects, while the University of California (UC)–Berkeley and the University of Florida are separately conducting the other two. Cyber physical systems consist of embedded computers that monitor and control physical processes, and feedback loops enable the components of the system to respond to each other. One transportation application of CPS is to get automated vehicles, traffic signals, and road sensors “talking” to each other within traffic operating systems. The potential benefits of this approach include more stable traffic flows, harmonized speeds through traffic signals, better use of highway capacity, and safer streets thanks to fewer driver errors. Various vehicle technologies can be used to create CPS in transportation. Examples include cooperative adaptive cruise control to synchronize the speeds of multiple vehicles, lane-keeping steering assist to keep vehicles from drifting, collision mitigation systems to warn drivers of approaching dangers and take automated action to avoid them, and automated emergency braking for pedestrians. Sensors such as magnetic detectors, radar devices, cameras, and inductive loops embedded into highways also are part of the system. They keep tabs on vehicle speeds, the distance between vehicles, and other data. The elements within a CPS share information through wireless technologies such as vehicle-to-infrastructure, vehicle-to-vehicle, and dedicated short-range communications. FHWA and NSF are jointly backing research that is designed to overcome the challenges to implementing safe, secure, and dependable CPS in transportation. The data from static road sensors, for instance, may be limited. Individual vehicles within automated platoons may need to join or leave the platoons at certain points to optimize the flow through intersections. Algorithms also must be able to predict numerous traffic scenarios, including interaction with vehicles operated by drivers, and to pinpoint failures. The three research teams are seeking solutions to these and other challenges by running software tests in simulation environments and by conducting field experiments.